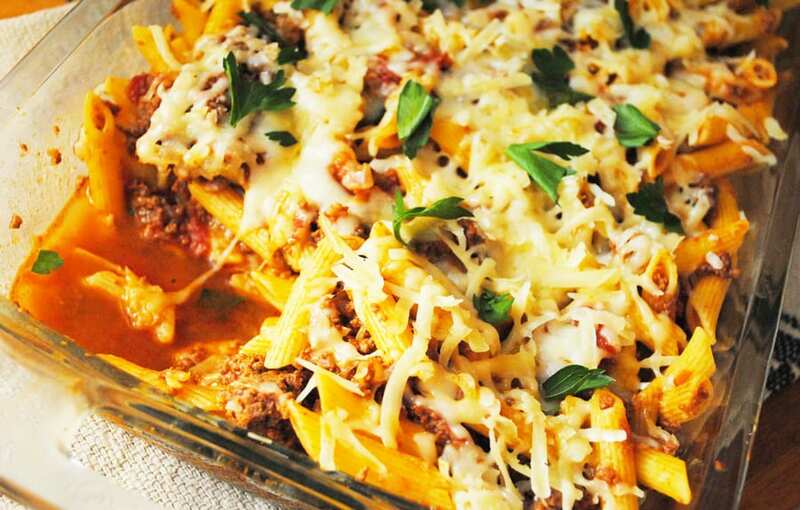 Classic Baked Ziti is one of my favorite cook ahead and freeze kind of meals. It pleases literally everyone, including the youngest dinner guests, and couldn’t be easier to assemble. This dish freezes VERY well and makes a great meal to bring to someone in need of one. My classic baked ziti is a little more involved than opening a jar of tomato sauce, but not a whole lot more. 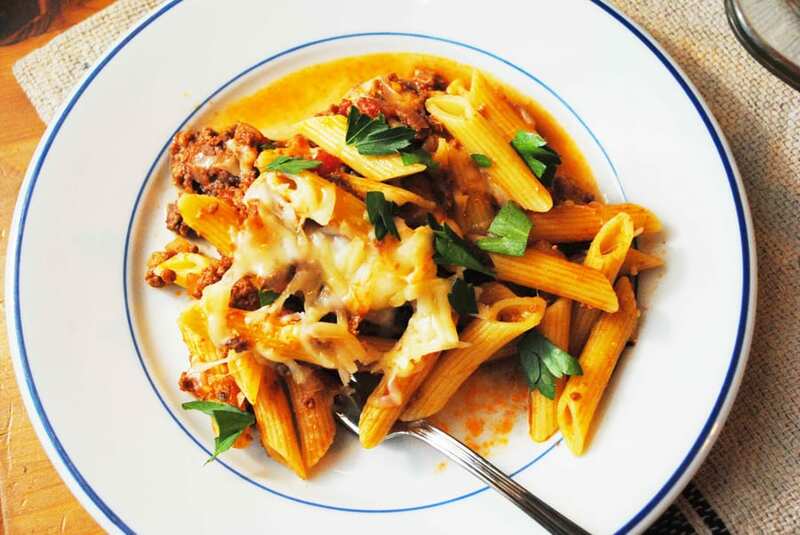 The delicious flavor of this ziti come from preparing your own simple tomato sauce and slow cooking your beef and sausage in it. Yes there is ground sausage in here too. Like I said, it’s delicious. My husband recently went on a hunting trip to New Mexico and came home with 300 lbs of elk meat. That’s another blog entirely, but needless to say I’ve been using elk meat in ways I never dreamed, trying to eat all of the animal. I’ve used ground elk and ground elk sausage in this for a leaner dish, and you can substitute any meat you would like. I’ve also used ground turkey with ground chicken sausage. My favorite way to eat it is with ground beef and pork sausage, but give it a try with anything. We’re in the Navy, I’ve transported a casserole or twenty in my day, trust me, I’m a pro. Pour the whole peeled tomatoes into a bowl and use your hands to break them up and crush them. You still want some bits of tomato. I suggest wearing an apron as the tomatoes can splatter. Set aside. Melt the 2 tbsp butter in the pan. Once melted add in the red onion and 1/4 tsp salt. Cook until the onion is just softened, about 4 minutes. Add in the tomato paste, anchovy paste and garlic cloves. Cook about one minute. Pour the tomatoes into the pot along with the additional 1/2 tsp salt. Add in the ground beef and sausage and stir until well mixed in the tomato sauce. Cover with the lid and turn the heat down to a simmer. Cook for 20 minutes. While the sauce is cooking, cook the pasta according to package directions in a large pot of boiling salted water. Combine the mozzarella with the Parmesan and garlic powder in a bowl, mix with your hands and set aside. After the pasta is done and the sauce is finished, drain the pasta and pour into the pan with the sauce. Mix well and then transfer half of the meat and noodle mix with a spoon into a 9"x13" casserole dish. Sprinkle with half of the cheese mixture. Top with the remaining noodle and meat mixture. Then top with the remaining cheese. Bake at 400 degrees for 15 minutes then serve. Sprinkle with the parsley if desired. ** If freezing, prepare the casserole and then don't bake it at the end. Wrap it with plastic wrap and foil and put in the freezer to freeze. To heat, pull the casserole out a day in advance and allow to thaw in the fridge then cook at 400 degrees, uncovered, for about 30 minutes. You can bake this from frozen, it just takes a very long time to cook. About an hour or more.